We've been waiting for this verdict since yesterday, when 3,000+ personnel were first stationed in the city, concentrated outside the South Jakarta District Court, on Ampera Raya, quite near the RAM duty free shop. On a frivolous personal note, Michael has actually said I can use a fairly pricey bottle of wine already in our cupboard to make shrimp and feta cheese for Friday dinner with Mark N. I'm not allowed to head for Kemang to restock until this blows over. 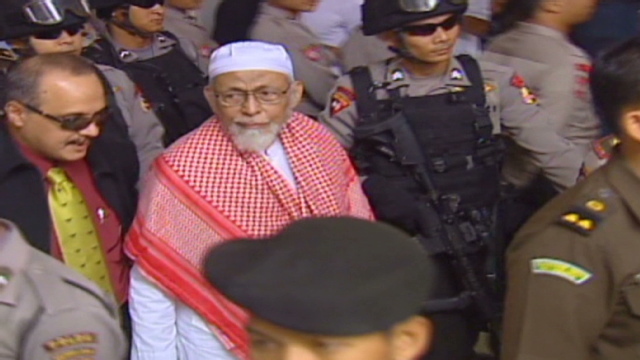 Jakarta, Indonesia (CNN) -- An Indonesian court sentenced radical cleric Abu Bakar Bashir to 15 years in prison on Thursday. Bashir was convicted of influencing others to provide funds with the objective they be used or likely to be used for terrorism acts. Prosecutors had demanded that Bashir be sentenced to life in prison. Bashir's organization Jamaat Tawhid Anshoru, or JAT, issued a statement saying it rejected the verdict because "it's based on laws formulated by infidels." "The authorities take repressive actions and intimidate clerics and Muslims, using the war on terrorism as a reason. If this is allowed to continue, it is not impossible for Muslims to be slaughtered." Authorities deployed 3,000 security personnel around Jakarta, most of them stationed in the area around the courthouse, said Jakarta police spokesman Col. Baharudin Djafar. About 500 Bashir supporters were outside the court listening to the proceedings. Banners saying "Free Ustadz Abu Bakar Ba'asyir" hung on the courthouse's fence. It was the third trial of the fiery Bashir, who was most recently detained in August for suspected links to a militant training camp that was raided by authorities in Aceh in early 2010. Police have said Bashir and his organization were involved in setting up the camp, and authorities have said militants were preparing to launch assassination attempts on Indonesian government officials. Authorities also accuse Bashir of plotting attacks like the 2008 Mumbai, India, assault on hotels and a train station that left hundreds dead in a siege lasting several days. He denies the charges, and has often said there is a U.S.-led conspiracy to put him behind bars. In the past, authorities have tried but failed to directly link Bashir to major terror attacks in Indonesia. In the first two trials, prosecutors tried to directly link him to the 2002 bombings in Bali and the 2003 J.W. Marriott bomb attack in Jakarta. The courts found him guilty of relatively minor charges. He was released in June 2006, after serving 25 months in jail. This warden message is to alert U.S. citizens in Indonesia that the trial of Abu Bakar Ba’asyir is tentatively scheduled to conclude on or shortly after June 16 at the South Jakarta District Court on Jl. Ampera Raya, No. 133, South Jakarta (just south of Kemang). A heavy police presence will be in place, but the potential for large, possibly violent, demonstrations and major traffic disruptions will continue to exist. We advise all U.S. citizens to monitor the local news media for ongoing activities related to the Ba’asyir verdict. All U.S. citizens are urged to avoid the area around the court by taking alternate routes. See map below. We remind U.S. citizens to exercise prudence and to continue to take active, personal responsibility for their security. We strongly suggest that U.S. citizens monitor news reports, follow the instructions of Indonesian authorities, and avoid demonstrations. We also remind U.S. citizens that even demonstrations intended to be peaceful can turn confrontational and possibly escalate into violence without warning.